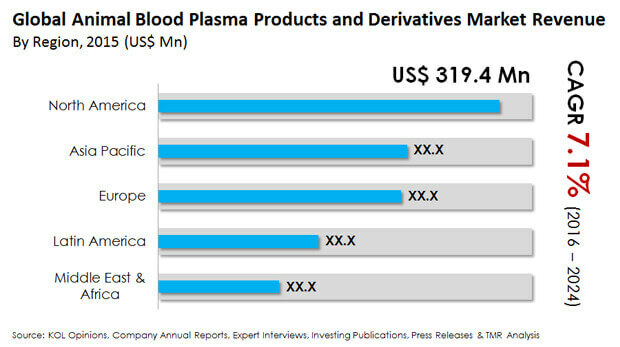 As stated in a research report released by Transparency Market Research, the competitive landscape of the global animal blood plasma products and derivatives market is currently fragmented and is likely to remain so over the coming years, due to the presence of a large number of regional players as well as a plethora of globally prominent names. Sigma-Aldrich, Thermo Fischer, and Proliant are some of the leading entities in the global animal blood plasma products and derivatives market and had collectively held over 76% of the market’s share in value in 2016. The overall competitive scenario in the global animal blood plasma products and derivatives market at the moment, is marked by a large number of vendors that are aiming strongly at the enhancement of their own distribution networks, either through consolidation of partnerships with manufacturers, suppliers of raw materials, or local distributors. Despite regional differences, most players in the global animal blood plasma products and derivatives market are likely to show similar expansion strategies of mergers and acquisitions, and business partnerships, especially in emerging economies. Projections in the report reveal that the global animal blood plasma products and derivatives market is likely to reach US$1.92 bn by the end of 2024. The market is expected to expand at a CAGR of 7.10% within a forecast period from 2016 to 2024 and was calculated at US$1.04 bn in 2015. “One of the key applications of animal blood plasma products lies in the manufacture of pet food. The subsequent rise in the global consumption rates of pet food is therefore a primary growth driver for the global animal blood plasma products and derivatives market,” states a TMR analyst. The use of animal blood plasma products in making pet food provides a wide variety of benefits, and the growing awareness among consumers for this fact has been pushing the demand experienced by the global animal blood plasma products and derivatives market. A large number of animal plasma products and derivatives are currently being used as alternatives to conventionally plant based nutrients and extracts to fulfil the gap in supply and demand in the pet food industry. The global animal blood plasma products and derivatives market has been boosted additionally through the recent improvements in the supply and distribution networks, which is likely to continue supporting this market for the long run. The global animal blood plasma products and derivatives market is currently being restrained by the problems related to the pricing of raw materials required to manufacture these products and derivatives. The global animal blood plasma products and derivatives market faces additional complications from the growing instances of animal diseases spreading among both livestock as well as pets, creating problems while producing animal blood plasma. “The global animal blood plasma products and derivatives market is likely to present several key opportunities in North America over the coming years. This region has been a top draw for players in the market and is expected to remain the leading region to provide ample demand volume for animal blood plasma products and derivatives over the coming years,” adds the analyst.